We have been asking for the ability to "turn off other players effects" for 5 years. They don't care that the game is a seizure-inducing light show. That feature has been in every game I have played since 2001, except GW. The worst part is, someone suggested I try FF14 for an example on how this could be done better. I started it, and didn't understand what the point was, even my simplest spell effects were garish as hell. But (take not ANet! ), it has options! I can seperately set spell effects to full, reduced or none for me, my party, friendlies and enemies. I can see things during combat!!! Modern technology is fascinating! It becomes very difficult to follow an enemy when everything is flashing like that, no matter what position the camera is in. It gets difficult to do meta events when you can't follow enemies on screen. In diablo it´s kind of a mess, even more than it is in gw2. In high rifts you better have sunglasses on, otherwise you´ll not be able to see what´s really going on , on the screen. For example, spinning lasers that can kill you in a few seconds, some enemies leave a explosive bomb upon death that looks like a small vulcano and much more. Important to note though is that Diablo is a 1-few single- or multiplayer game. Not a 50++ MMORPG. 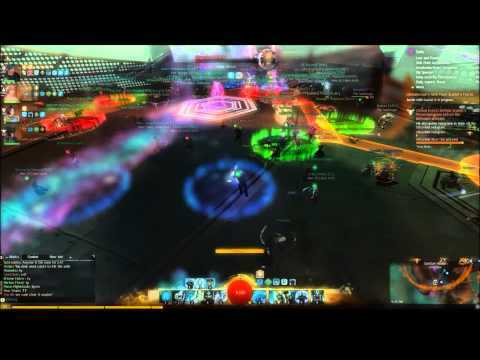 In something like GW2, I expect the developers to have put significant thought into how screen effects work in large groups of players. Becaue well, massively multiplayer. When I started playing GW back in the day, during the first weeks I was so let down by the skill effects until I realize the fact that they were that way made it a more functional game. Nowadays I still like some cool flash over the top effects madness, I mean I really dig cabal online skill effects, but every game should be - praticality > effects and not the way around. Basically, the game needs a running special effects "budget", and once you get too many flashy effects in a scene, it should start cutting some back to simple, legible effects, starting with those of unaffiliated greens and trash mobs, then the environment, party members, bosses, and as a last resort, your own. Players should be able to increase or decrease that budget in the options screen (from nothing to unlimited) for taste or performance. The question of accessibility (which is OP's concern) is a little different, since any number of certain effects are bad, and other effects are no issue at all no matter how many there are. That's probably best handled with a separate checkbox that always tones down certain problematic effects, or implements reverse HDR or something, where the implementation is based on medical rather than gameplay considerations. When it comes to flashy mobs the Awakened Heirophants sand spiny move is an bit to much for me at times. Being spun around at high speed is one thing but the flashing red is blinding. As I always say, instead of investing in new expansion, they could polish the engine and these visual problems, no matter how good an expansion is, these graphic problems kill any immersion. ... for example, Serpents Ire Meta seems great, except the 99% of fight u cant see the 2 giants mobs, shrouded in flash light effects. It feels like still nobody has done anything about it. My Laptop is just getting old and while in the beginning it was great to play, nowadays I'm just down to 10fps in newer maps which is just annoying. The technology exists to turn off other player's skins. In wvw you can set all other players to a generic class model. I don't know how that helps the people who made the OP. But as far as I'm concerned I've tried everything. Otherwise I wouldn't have made the comment here. "When she lifts her hand you have to dodge"
"How am I supposed to see her lift her hand!?" Honestly, this is a major reason why I fail at dodging. At least in other games (like WoW) you could see cast bars appear under the name plate, and you could see the target of your target, so if the boss was all of a sudden targeting you, your name plate would popup and you knew kitten was about to get real. Check the box Effect LOD at graphics options, it helps tremendous. Bottom line... Devs don't care about this problem?! What's there to care about? People unaware that they can reduce the flashing effects? Or the fact they already did reduce visual noise? They still have a few steps to go in that regard, but it's way better than before now. I play the game with a screen dimmer program because the flashing lights just hurt my eyes and I don't even have migraine/epilepsy. You cant overly reduce it but you can reduce it slightly(or alot depending on your definition). I dont see a ton of the effects in the game because of my visual settings, but the effects i DO see i want to turn off or reduce, Auras from infusions for some reason are immune to the settings i have set up and they are blinding to my eyes as an example. Saddly this means reducing my graphics settings to about half of what i normally run just to avoid seeing images like the screenshot provided earlier in the thread, and they have done some things recently to assist in the reduction of visual noise. During meta events, I have to play on the lowest settings possible because my computer is slower than a snail glued to a glacier. Even with every single setting turned all the way down - every bit of flashing effects turned down or off that I can - I still cannot see anything thanks to the giant blur of light on the screen. ...I'd love to know how to reduce visual noise even farther than that. A very good friend of mine is a long-time player of Guild Wars 2, but he's photosensitive and has severe problems with several boss fights, as well as some cutscenes. I'm adding my voice to the call for the ability to disable or otherwise significantly reduce the amount of flashing lights in the game. The amount of flashes in this game is ridiculous and none of the current graphic settings do much. It’s even worse for an engineer. I started leveling my engineer recently and since then, I’ve been using eye drops several times a day. I just got Holosmith and it’s even worse. Every attack is a flash spamfest. This is a legitimate health concern. What will it take for Anet to take this seriously and take swift and meaningful action? A lawsuit? Something we asked for years now and they still didn't do it right. Bit better than it used to be, but still long way to go. Remember Battle of Lions Arch? Yes, it's really bad. Most fights I can't even see who I am hitting, so I have to spin around until I see damage numbers appearing. I went into my graphic card settings and lowering Post Processing helped a little, but not enough to help in some Boss fights. The final engagement in the HoT storyline is an example - you have to hit the minion of the boss to get rid of it and make the boss vulnerable, but it's like playing Blind Man's Buff there are so many flashing effects. I had to give up. I'll echo the sentiments here. The ability to turn off friendly / enemy/ squad/party... even self-effects may seem like a bandaid in terms of dev vision and the alternative of going through each and every effect and making a photosensitive-friendly version may be out of the question. This, I understand. But it is an opt-in and a health issue. Please consider the band-aid. I mean, it is hard to explain to people who have no issues with this, obviously but to give you an idea, I love my Mirage and I'd like to main her but I can't if I'm not at my best that day because when I'm like that, I can't look at the screen and stay sane for extended periods of time with all the flash. So I main other classes when people depend on my ability to pull my weight. Now, my particular case, I don't expect to be sorted at all - if I can't Mirage, I can't Mirage. I understand there is a limit to what the design philosophy would allow. Since the design is focussed on making the gunplay more reliant on senses than the UI, I expect a self-effect slider to never happen but that was meant as a means to convey how it is for some people. I agree that somethin MUST be done about this. It's really just to much. I myself for example need to avoid Bloodstone Fen and have developed the habit of quickly closing my eyes on mount/dismount just to reduce the stress on my eyes. For KITTENS sake, guys! why can't Anet just make an option to disable other player's effects? Thats why i never park in Divinitys Reach. The mount skins dyed with the most brightest colors, Same with certain armors and backpacks burn in my eyes like a new big bang has started. In gw 1 times i couldn't stand people spamming Ray of judgement (the monk skill), looking back it was childsplay compared to this and the Op mentioned skill effects ofcourse. Would be nice if we could turn of the light/sparkling effects of both from other players. Or introduce watered-down graphics options so we can still see our own effects and other players' effects - kind of necessary in PVP and such - but they don't light up the area around them or provide bursts of light and color whenever they hit other players/NPCs. they can water it down to a crisp and still would be worse then just disable effects from other players, the server still needs to send the effects back and forth to clients, making the FPS lower. GW2 runs on an ancient old engine that depends on single core CPU's, lowering the effects isn't gonna help when the engine is horrible at processing effects. This is one of the few and by far the biggest complaint for gw2. One of the bigger problems with all the flashing lights, is that in this game to target a monster requires that you can actually see it , so that you can left click on it . In some of the previous games Ive played, eg WOW, Lotro and Aion to name a few, they all supported the target command in the chat line . ie you could type target < name of monster> and the targeting system would target it , even if the monster was totally obscured with visual effects. GW2 doesnt have this option , and adding it would solve a lot of the targeting problems. The targeting system in this game is pretty well broken unless you can see and click on the monster. Most of the key bind targeting commands will randomly target wild boars, Moas , just about anything other than what you are trying to target. Even if you are successful in targeting the monster you want, the targeting system will randomly jump off the wanted target on to other random targets nearby. Not only would it help with the horrendous visual clutter but it would help with performance bigtime!! This option should have been included years ago. This is my biggest gripe and why I no longer play. The best thing are the volatile magic bubbles in the LWS4 maps. Flashbang your whole screen while hearing a farting noise for incredible 2 volatile magic and a free epilepsy attack. Which QA seriously lets this slip. I'm still "supporting" the attacks effects after 6 years, but I'm almost at my limit. The worst was for me the latest cinematic "ls4e4 Aurene visions" and I urge her to be changed, I'm not subject of Epilepsy, but when watching her I almost had a crisis. Felt weird with my eyes starting to blink. I'm not joking, it's a serious health issue that should be take in account for THAT cinematic but also future ones, we aren't speaking about phobia here, but EPILEPSY a serious issue. We should be able to toggle weapon effects. My eyes are burning we can't even see the looks of the characters what's the point. I REALLY expect that some peoples of the teams will take in account that very IMPORTANT SUBJECT which is HEADACHE AND EPILEPSY. Seriously I don't see the aim of aurene visions apart making people sicks, thing that will discourage peoples to watch cinematics, and in worst case leaving/not playing the next epidode. See, im glad i only have an issue of getting motion sick in video games, but i will agree that that scene made my eyes hurt and ive never had any issues with effects in cutscenes, movies, or games affecting my eyes before. Is there any kind of information you could possibly give us on further options to disable graphic effects, or..well anything at all? ○ View my skills effects. ○ View my legendaries effects. = The joko cinematic of E3 was perfect, a good example of what to do. No flashing lights and weird effects like you was in a disco party. Note that here, flashes are only at the beginning and ending, only two slow white flashes. But I suspect the colour white to be a cause too, that's why I suggested black fading. Ya man the flashing effects in this game are ridiculous, one of my major triggers for migraines like the OP. Its silly. I recently got stuck with a semi permanent case of photophobia (discomfort/pain/physical sensetivity to light) It's stopped me playing this game for now b/c of all the dang light effects. an option to dim stuff or turn said effects off would be life saving. take away the visual effects would be like chopping off the infusion gang's kitten... It wont happen because visual effects in gw2 are endgame material. take them away and those that plough 100's of hours and 1000s of gold/cash into them lose a reason to play and anet lose business. We’re not talking about removing visual effects altogether. We’re talking about reducing unhealthy flashes that cause seizures, migraines, and eye pains. Devs want to make the game look good. I get that. I’m a graphics kitten. The way it is done in this game, however, is just so mind numbingly idiotic. I have never played any other game with flashes anywhere near this bad. In any case, I’m extremely frustrated that I can’t play my engineer at all and resigned him to a storage character. Holosmith is the only spec I enjoy on my engineer, but Holo is unplayable for me because every attack causes minor flashes and every Holo skill causes major flashes. I’m not even talking about flashes from other players. Flashes from my Holo alone are hurting my eyes. And I’m playing with Gunnar computer glasses, my monitor’s brightness and contrast set to low, and in a brightly lit room while taking eye vitamins every day. This is just ridiculous. If Anet gives a kitten about player health, this should have been fixed years ago. This issue literally pisses me off. You can TAB cycle through the enemies to target what you want. Not a solution to your flashiness problem, but it does allow for non-mouse click targeting. "It loses Anet money" - well, have you seen Lowest character detail? Everyone is wearing generic weight armour and nothing else. This doesn't stop people from making legendaries though. Flashes disabled LOCALLY is not going to lose Anet anything except maybe some dev time. However, this is a health issue. I can't play as long as I'd like to play. I'm pretty sure there are a lot of people on the same boat. It would make the game much more friendly to those of the atypical optic nerve persuasion. ANet is going to market and produce a game that will capture the largest margin of their target audience according to the statistics that only they have. Forums typically represent a very small portion of the entire player-base. 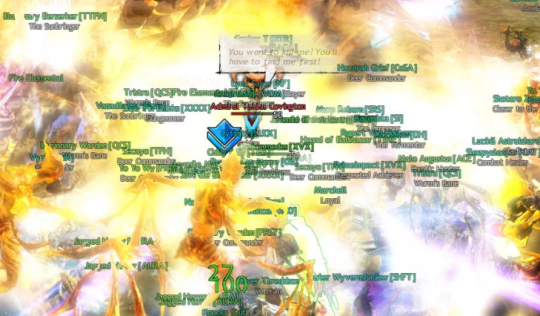 It seems to me that ANet knows that they will gain more revenue with flashy effects that will attract the most players in their targeted demographic. I won't go so far as to say that they don't care if some players have health issues that may be impacted by this decision (and others -- search the forums for the spider phobia threads); however, at the end of the day they will market/produce a product that will be the most profitable. Sorry, but I believe that flashy effects are here to stay. These effects are ways for players to show off, and if ANet implements a feature that allows players to disable the effect, then the perceived value of these items is significantly lowered. This lowering of perceived value might discourage players from spending time/money going after items that produce these effects which will impact ANet's bottom line. And the bottom line is really what is important here. I literally do not understand how it is any different than changing everyone's appearance to generic weight armour? Which you can do right this moment? How is that even an argument? "They do not care" is valid. "It undervalues the flashy effects" contradicts what is already in the game. It's a perfectly valid business argument. Why would so many players spend their time/resources/money/gems on chasing down items with these effects if they can't show them off? Yeah, it's an ego thing (some would call it kitten, if I can use that term here?). If players knew that there was the option for others to not see their effects, then the drive/desire to go after them would decline thus losing money for ANet. kharmin, I literally can disable your legendary armour look. My question is not whether it is a valid argument in a vacuum or not. My question is why this is even an argument when I can make everything generic and all I see is generic particles from no one in particular. Also, the legendary auras and such are NOT the problem for the majority of photosensitive people. White strob / eclectic strob is. If your argument had actual hold in Anet's vision, we'd never have the ability to disable people's looks. We can and even NPCs look flashier in that situation.